Like a lot of other nations, the U.S. toyed with the idea of a ‘Super Heavy’ tank. The initial concept was conceived of in May 1940. It was to weigh 80 tons, have two turrets each fitted with a 75mm gun, with two more turrets with 37mm guns. Armour was to be around 75mm thick. 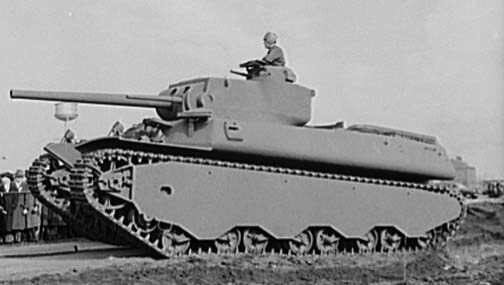 By October 1940, the specification was revised as the T1 heavy tank. This new specification called for a weight of 50 tons, a single turret fitted with a 3 inch gun and a co-axial 37mm gun, while the armour specification remained at 75 tons. It was to be powered by a 925hp Wright engine and have a top speed of 25mph. In February 1941 an order for 4 pilot models was placed. Each of these pilots would have different hulls, transmissions and other components. The first pilot to be completed was the T1E2 in December 1942, just after the Pearl Harbour attack. The T1E2 was 27ft 8ins long, 10ft 7ins high and 10ft 2 ½ins wide. It had armour between 25mm and 100m thick. After some modifications were made it was standardised as the M6. The next to be completed was the T1E3 which was then standardised as the M6A1. This only had one difference to the M6A1 and that was the welded hull. Originally there was to be a production run of 100 per month, rising to 250 per month, with a total of 5,000 tanks being planned. However, this was cut down to 115 to make way for more aircraft to be built. At the same time, the Armoured Force had been testing the pilot models and didn’t like them. They found them to be too heavy, under-gunned, the wrong shape and therefore only of limited use. 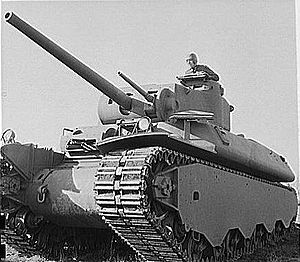 In March 1943, production was further cut to just 40 tanks, all of which were completed between November 1943 and February 1944. When the M6 was originally conceived, it was one of the heaviest, biggest and most power full tanks in the world and yet, none saw any service. Instead they were used as trials vehicles, a role in which they proved to be very use full. They were used to test an electric transmission and the 90mm gun later used on the T26E1, which later went on to become the M26 Pershing. The M6A2 very nearly saw action during WW2, when it was planned to convert fifteen by fitting a 105mm gun, however, the project was cancelled and in December 1944 the tank was declared obsolete.